Fernandina Beach, FL, Orthodontist Answers: When Should My Child See An Orthodontist? Are you wondering when or whether your child should see a Fernandina Beach, FL, orthodontist? Happily, the American Association of Orthodontists has provided all parents with a fairly quick and easy answer. 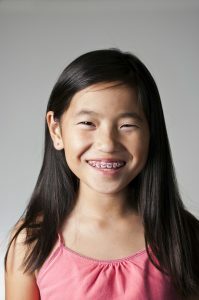 According to the AAO, every child should be evaluated by an orthodontist at or around age 7, even if their parent does not have any immediate concerns. If My Child Has No Obvious Problems, Why Should An Orthodontist In Fernandina Beach, FL, Evaluate Them? Sometimes children may have underlying structural problems with their jaw or incoming teeth that aren’t apparent at first glance. X-rays and the eye of a fully trained orthodontic specialist can help to identify potential developmental issues before they can turn into a big issue. By visiting a Fernandina Beach, FL, orthodontist and having your child evaluated at age 7, you may be saving your child from having to undergo far more invasive and expensive treatment later in life. When your child is 7 years old, his or her mouth is a blend of baby and adult teeth. As the rest of the adult teeth come in, your child’s orthodontist can help to guide jaw development to ensure adequate room for the remaining permanent teeth to erupt without crowding other teeth or causing other problems. Even if your child turns out not to need early intervention treatment, this initial evaluation can provide you with an outline of what to expect between the 8-year and 18-year mark. You will have a good idea of whether you should start saving for future braces or other orthodontic treatment. Since many orthodontists will provide your child’s initial evaluation at no cost to you, you have everything to gain and nothing to lose by following the advice of the American Association of Orthodontists. What Are The Signs That I Should Bring My Child To A Fernandina Beach, FL, Orthodontist? As we mentioned above, you really should have your child evaluated even if none of these warning signs are present, because there may be underlying structural issues not apparent to the naked eye. Nevertheless, if your child appears to suffer from any of the following, then we recommend not postponing their early evaluation appointment at an orthodontic office in Fernandina Beach, FL. We all know how important our teeth are. They help us eat each day, thus aiding in the nourishment we need to survive. They provide us with a confident smile when we’re around others. Teeth can also lead to many health problems if not properly cared for. Coastline Orthodontics in Fernandina Beach, FL, can give your child a jump start on straightening teeth, correcting bite concerns, and aligning the jaw. A happier and headache-free future for you and your child starts with a free evaluation with our Fernandina Beach orthodontist today. This information is not meant as medical advice. It is provided solely for education. Our orthodontic office in Fernandina Beach, FL, would be pleased to discuss your unique circumstances and needs as they relate to these topics. Feel free to give us a call at 904.751.6030 or click here to schedule a complimentary exam and consultation with one of our 5-star-rated orthodontists.